Some 400 people will gather in Randolph Center on a mid-September Saturday to talk about economic opportunities for women. For 21 years now, Sen. Patrick Leahy (D-Vt) has sponsored this free event. Among the sessions on the agenda: Find a Career That Fits. The workshop's description boasts, "We will dispel career myths and encourage you to broaden your thinking about your career options — including an exploration of nontraditional and trades-related careers." Another session: Ask for More, Get More: The Art of Salary Negotiation. And another: Women's Car Care Clinic: What You Need to Know. Really? I thought as I read the list. Is this 2017 — or 1967? Are women still dispelling career myths and wringing our hands over how often the car needs an oil change? Yes, we are. 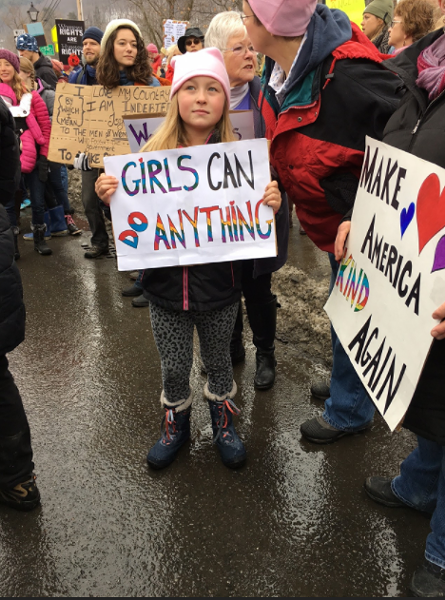 While American women have more rights and opportunities today than 20, 40 or 60 years ago, the drive for equality is stalled on a number of fronts. Vermont is, after all, a state that has never sent a woman to Congress and has elected just one female governor. We Vermonters are fond of patting ourselves on the back for our progressive ways, but perhaps we should spend more time soul-searching. Women in the Green Mountain State earn, on average, 84 cents to the $1 that men make. Yes, that's an improvement from 73.8 cents in 1997, but it's still 16 cents shy of bringing home the same bacon for the same work, notes Cary Brown, executive director of the Vermont Commission on Women. Other measures show less progress. In 1972, 20 percent of computer programmers nationally were women, according to U.S. Census Bureau data. By 1990, that number had climbed to 36 percent, but by 2012 it had slipped to 23 percent. Occupational trends in Vermont have mirrored the nation's, says Tiffany Bluemle, who runs the 4-year-old Change the Story initiative, which seeks to improve the economic status of women in Vermont. U.S. Labor Department stats show that women still hold most of the prekindergarten teaching and dental assistant jobs in Vermont, while men have virtually all the carpentry duties, she notes. A decade ago, 19 percent of Vermont selectboard members were women. Today, the number has only inched up to 21 percent, Brown says. The state legislature, long touted as one of the most gender-balanced in the country, is 39.4 percent female, but the numbers have scarcely budged toward parity in the last couple of decades. From 1993 to 2017, the percentage of women elected to the state House and Senate increased just 1.5 percent. Bluemle, who is 56 and came of age on the heels of Title IX, has a theory about why progress has stalled. When she graduated from college in 1983, Sandra Day O'Connor had just been appointed to the U.S. Supreme Court and Sally Ride was making history as the first American* woman in space. Bluemle was working on Democratic presidential candidate Walter Mondale's campaign. His running mate, Geraldine Ferraro, was the first female vice presidential candidate for a major political party. It felt like equality was at hand. "It lulled many in my generation to think things had changed more than they had," Bluemle says. Jennifer Chiodo, principal owner of CX Associates, an engineering consulting firm in Burlington, has seen the same plateau in her profession. Since she graduated from Brown University in 1981 as the only woman in her class to earn an engineering degree, the number of women following her hasn't increased, she says. "I have to say it's surprising the ratio is still the same," Chiodo says. That, Chiodo says, is a lost opportunity. "Engineering is a field that really has a lot of potential to affect change and to earn income you can live off," she says. Statistics collected by Change the Story show how slow the business world — particularly big-bucks business — has been to change. The number of female-owned firms in Vermont grew by 15 percent from 2007 to 2011. But male-owned companies far dominated in revenue, generating an average of $498,374 a year, compared to $94,695 for their female-owned counterparts. Women are poorly represented as chief executive officers and on boards of high-revenue firms. Women lead only eight of the 100 highest-grossing businesses in Vermont, Change the Story notes in a 2017 report. It would be easy to question why any of this matters or why men should care whether women succeed in business or government. One could argue, aren't we at a point where every man and woman is on his or her own? If the number of women-owned businesses matched the number — and revenues — of male-owned firms, the state's economy would see a $3.8 billion boost, Change the Story points out in a 2016 report. If 25 percent of the women-owned companies added an employee, Vermont would see 5,200 new jobs. "I would argue everybody has a stake in women's well-being," Bluemle says. 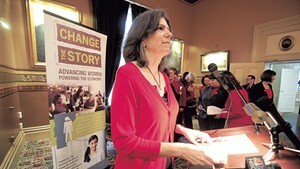 Diane Derby, a Leahy aide who organizes his Women's Economic Opportunity Conference, says its focus has evolved. Young female entrepreneurs have, in recent years, been asking for more sessions focused on financing startups. One workshop, Investing in Women (You Don't Have to Be a Millionaire! ), has filled to capacity, prompting Derby to add a second one. But the old standbys do well, too, she says. A second session of the salary negotiation workshop was added because of demand. Women are, after all, 16 cents behind on every dollar earned. And the workshop about how to care for your car? It seems like that should be a quick, easy lesson: Find a reliable mechanic and stick with him — or her — like glue. But Derby says the session remains popular. Perhaps even this lesson is not as easy as it should be. On Saturday, I overheard a young woman talking to her friends about a mechanic. "The last time I took my car to him, he asked me if I wanted my husband to approve the tires," she said. Discouraging: A mechanic asked that question in 2017. Encouraging: The woman knew the query was absurd. When Gov. Phil Scott announced last month that NSK Steering Systems America had received a $208,000 Vermont Training Program grant, state Auditor Doug Hoffer cringed, as he has done many times over the years. "If it's a multinational company with deep pockets, training is typically part of the cost of doing business," Hoffer says. NSK Steering, an international firm that makes automotive steering systems, has a plant in Bennington. The money will fund the training of 325 employees. The facility's work requires more advanced technicians, the company said in its grant application. NSK said the grant would help draw future work to Bennington but would not result directly in pay raises or new hires. Even back when he was a fiscal analyst who occasionally worked for the legislature, Hoffer argued that the state gave too much of its economic development money to large companies without assurance that Vermonters would benefit. As auditor, he pointed out flaws in the Vermont Training Program in a 2015 memo to the legislature. But his objections haven't changed policy. His memo argued that the grant program lacked internal controls to ensure that recipients used the money to supplement, rather than replace, existing employee training. Nor could officials prove that the training led to raises. And Hoffer questioned whether the bulk of the grant money should go to the same large companies year after year. While more than 260 firms received grants, 20 claimed nearly half the money, including IBM, Keurig Green Mountain and General Electric, Hoffer's memo said. Last year, the largest recipient of Vermont Training Program money was Imerys Talc, an international company with a plant in Ludlow. It received $160,000 of the program's $1.7 million. Joan Goldstein, commissioner of the state Economic Development department, defends the program. Last year, 30 percent of recipients were small businesses, she says. The list includes Maple Landmark of Middlebury, Olivia's Croutons of New Haven and Stone Environmental of Montpelier. But helping out-of-state firms with Vermont facilities is also important, she says, since they have the opportunity to move work elsewhere. "That new contract may go to Texas," she says. "We are constantly competing." Very small companies would be hard-pressed to qualify for the Vermont Training Program, she says, as employers have to pay up-front for the training, then get reimbursed. They also must provide a certain level of employee benefits and pay at least a $13 hourly wage. She says employers must certify that the training will be supplemental rather than routine. Hoffer says he'd like to see more of the taxpayers' dollars help small, growing companies. But he and Goldstein agree: For that to happen, lawmakers would have to change state policy. Will they? Maybe; maybe not. Sen. Michael Sirotkin (D-Chittenden), likely the next chair of the Senate Economic Development, Housing and General Affairs Committee, says he hasn't forgotten Hoffer's 2015 memo. A newly appointed 13-member panel tasked with studying how to better coordinate the state's workforce training programs should also ensure that those programs meet the state's goals, he says. "It sounds to me like we could do better," Sirotkin says. When Robin Turnau announced last week that she was leaving Vermont Public Radio after 28 years — the last eight as president — she gave plenty of notice. Turnau alerted VPR board chair Peggy Williams of her interest in moving on several weeks ago and will not depart until March. That's how long Williams expects finding a successor to take. Williams, a retired college president, says the station will hire a firm to help craft a job description and conduct a national search. Williams says VPR isn't looking for a new boss who'll shake things up. "We have just adopted a strategic plan in the last year," Williams says. "We're looking for someone to keep moving in that direction." Indeed, Turnau leaves VPR in a strong position. When she started working there in 1989, the station was raising $500,000 a year from members and had a hard time making payroll. Now, VPR raises $4.5 million a year from members. The station has built one of the strongest news teams in Vermont and just completed a $10 million building expansion in Colchester. Turnau says she still loves the job. So why leave? At 52, she says, "I want to find out what it's like to work somewhere else. It is a leap." *Correction, August 23, 2017: A previous version of this story did not properly identify the first woman in space.